A simple but one of the best games I’ve ever played. I’ve discovered the last portal naturally. The last one I’ve found (and the hardest I think) is the one based on the diagram…. I was trying to find paths related to the symbols, I’ve always preached that not everything needs a meaning, sometimes we should just be like the Seecha, things can be solved that way too. – where are the parts of the diagram from? Who made them? – you say Oarbor is dead, and it knew when and how he would die. So what happened to him? The Seecha did not capture him, but got even advice from him. In all this reverie what could have happened in the meantime after both Seecha and Lorem left? – will you make a sequel to this game? I’ve really enjoyed it!!! Great little game!!! I did need help with number 2 and the second lighthouse puzzle. I read the other comments but I just can’t find the number 8. I think I found all of the signposts…but then, how come I can’t find the portal? Awesome little game! It reminds me of a book I read by Haruki Murakami, called Hardboiled Wonderland and the End of the World. I really like how you managed to imply a lot of depth with relatively few pieces of information about the different cultures. ^^^I agree about the Hardboiled Wonderland feel to the game. There’s a kind of wistful feeling that I get reading his novels that I usually end up getting while playing your games, Greg. It’s very… refreshing, maybe, but that might not be the right word. Just wanted to say that I REALLY loved this game. I’m a big fan of more exploration-oriented games like Myst and Knytt, especially ones that have a lot of secrets to find, so this was extremely enjoyable. I felt like most of the puzzles were exactly the right amount of difficulty, too, which was nice. My only frustration was that I found the third-to-last hidden signpost first, followed by the last, so I was having a bit of a time trying to find the earlier ones… By the time I found the first one I’d seen nearly all of them. Nothing that was a problem with the game itself, I just felt silly stumbling into clues I apparently shouldn’t have found yet. Hey Gregory, couldn’t find an email. Just wanted to say I love the game and we’ve just done a story on pcgamer.com about it. Thanks for letting me know, and for doing the story! I’ve made my e-mail more obvious, since I’ve gotten several requests to make it easier to find. It required me to check hints/walkthrough; in an attempt to save my poor fingerbones while figuring out the world I hadn’t gone out to the very corners of the map, but stopped once the fences were in sight. A clue (say a dot-cluster) somehwere near at least one of the corners would have been very, very helpful. And once I found those signposts, I searched for more internet help for ages and ages (at least half an hour), certain I was using the info from the posts wrongly, but it turns out that one of the signposts (ironically the one that looked like the most perfect angle) was one tiny button-press off from 90deg E.
I agree with above commenters that the lightposts/stars (assuming that Jan/Sept or Lorem called them the stars? since the Seecha never saw them… hm) need revision: one, a way to recognise increments of the angles (and thus when they are angled correctly), and two, for the X button to work whenever the X prompt shows up, not just directly south. I had some problems with this in other places, but the lightposts were by far the most frustrating. Using the lightposts for two different ending solutions could also be handled a bit better as some have noted, maybe in terms of message wording, say some sort of clue to indicate that it’s the *same* posts. I got kinda confused the first time I jumped through a portal and found myself back at the beginning; I worried I’d ended my game by accident. Checking inventory reassured me – but it took me a very very long time (and another hint check) to realise that while the items and locations stayed discovered, the hidden signposts DIDN’T, and that’s why the portal south of the final one was missing. Numbering the signposts would also have helped for those of us who found them out of order (and would work well I think given that the inventory items are also all numbered). This was an intriguing and enjoyable game, both relaxing and (mentally) stimulating. Even when I got frustrated or confused I kept at it to figure it out; I wanted to see where it went. Great storyline evolution. I like the minimalist (but not mindnumbingly repetitive) sound and I liked even better to learn it was all home-grown! 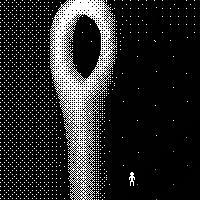 The 1bit ah, colourscheme, was great and managed to tickle the nostalgia bones without overshadowing the newness/uniqueness of the game. Paths (with the exception of those pesky corner posts) were well-handled, the subtle object twinkle was perfect, and I liked the little bug(?) creatures and their little noise. The Jan/Sept (and I like the name choices, generated much thought for me) dialogue was compelling, not overdone. All in all, compelling and not overdone. An enjoyable use of an evening, will recommend!